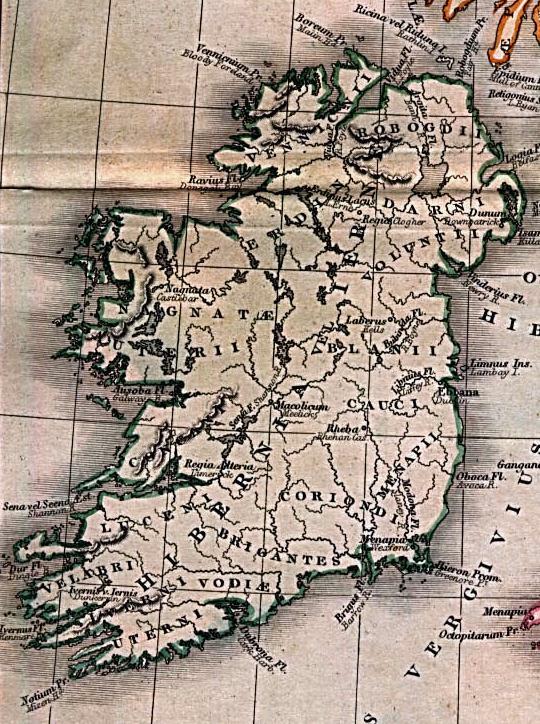 Many tribal names on the map above are derived from Ptolemy's early geography of Ireland, circa 150 A.D. It is a rough interpretation at best, since the original tribal or territorial names were a mix of Greek/Latin/Arabic. In a large window from 2000 to 300 B.C., the first Celtic peoples are estimated to arrive in Ireland. The major language spoken by the Celts in Ireland is known as Goidelic as opposed to the British form, Brittonic, which was also spoken in parts of early Ireland. Prior to the arrival of the Celts, who arrived in multiple waves, the mythological tribes of Ireland included the Fomorians (Fomhóire). In the Northeast, the Robogdii may be a corruption of Redodii, which would indicate the Dal Reti, or the Dal Riata, who later colonized Scotland. The Cruithin are thought to be of the same tribal group as the Picti (Latin) of Scotland, and later referred to as the Dal nAraide. The Darini may be a people claiming descent from Daire, of which the Dal Riata and Dal Fiatach of Down also claim descent from. The Voluntii were also known as the Ulaid, a name later to become Ulster. The Ulaid had their cult center at Eamhain Macha (near Armagh). In the East and the Southeast the Cauci (Kauki) and the Ebdani are dynasties which seemed to have disappeared by 400 A.D. The Menapii are the same as the Monaig, who survive into the early Christian period as the Fir Manach (Fermanagh). The Coriondi (Koriondi), perhaps related to the Celtic tribe of Corionototae in Britain, left no trace in Leinster but possibly turn up again as the Coraind of the County Sligo area, as well as in the tribes of the Cuirenrige and the Dal Cuirind. The Brigantes are of the same tribal group which occupied much of the north of Britain during the time of the Roman Empire. The Usdiae (Udiae or Uodiae) are perhaps the early peoples of the territory known as Osraige, later to become Ossory. The Dumnonii, who also settled in Devon and Cornwall in Britain, occur in Leinster, and later in Connacht, as the Domnainn. In the Southwest the Iverni were of the Erainn tribes and included later dynasties such as the Corca Loigde who ruled in Munster prior to the rise of the Eoghanact dynasties. The Gangani tribe was also found in North Wales. In the West the Auteini are later identified as the Uaithne of County Limerick and Tipperary. 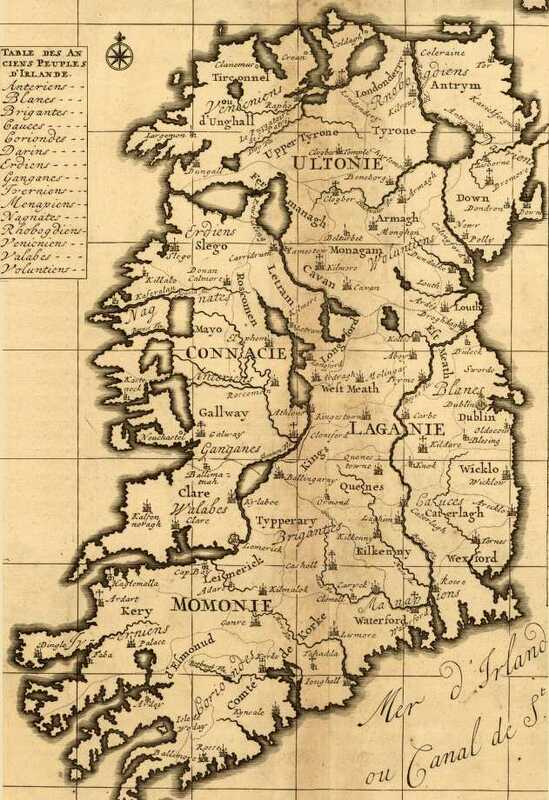 The Nagnatae seem to have no historical equivalent, although an early name for the cóiced (fifth) of Connacht has been given in Irish texts as Fir Ól nÉcmacht (or Nécmacht). The proportion of Ptolemy's geographical and tribal names that can be identified with names occuring in Irish literature is perhaps one in four. This has lead some to believe a map was created at a time earlier than Ptolemy. Previous to the Roman conquest in Britain the only Greek geographer who is known to have visited the 'Pretanic Isles' (aka Britain & Ireland) was Pytheas of Massalia, whose voyage is cited in the latter half of the 4th century B.C. Could some of the names used by Pytheas in his lost geogrphical treatise have survived to a later period? Perhaps there were other unnamed geographers who may have contributed tribal names from a period before Ptolemy's work was published. 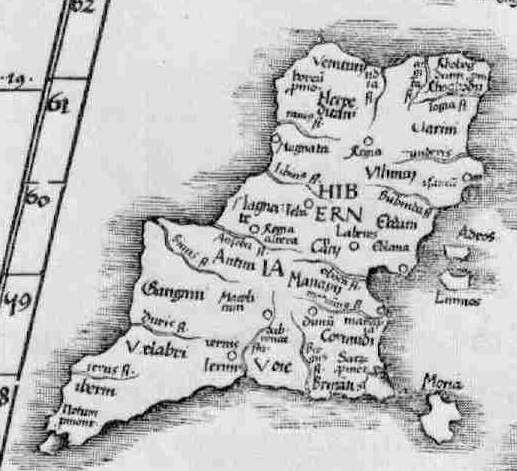 What is apparent from Ptolemy's map is perhaps the earliest "evidence" for the presence of a Celtic language in Ireland. The Irish tradition tells of various peoples who arrived on the island over an extended period of time. Modern scholars, supplemented by available archaeological records, tend to support the arrival of Celtic language and culture into Ireland over an extended period of time. Martin Waldseemüller's British Isles, produced c.1522-1523. Henri Abraham Chatelain's Carte Ancienne et Moderne de L'Irland, produced c. 1719 in Atlas Historique. Alexander G. Findlay's Insulae Brittanicae, produced 1849 in A Classical Atlas of Ancient Geography. Historical Maps of Europe at the Perry-Castañeda Library.